Veteran journalist and author Joseph C. Goulden reviewed Loch K. Johnson’s Spy Watching: Intelligence Accountability in the United States for the Washington Times. Although the political correctness of the times dictates that few persons in the intelligence community would publicly agree with Mr. Casey, such a sentiment exists, even if sub rosa. Mr. Johnson, a professor at the University of Georgia, has been pushing for enhanced intelligence oversight for more than 40 years, commencing with his staff work with the Senate’s Church Committee in 1975. 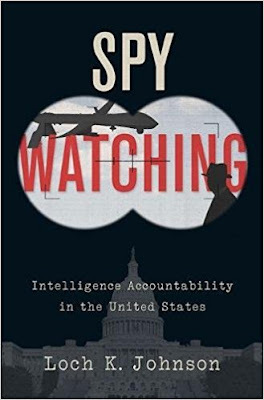 The intelligence community was reeling about disclosure of programs that, in Mr. Johnson’s understated words, “strayed outside the boundaries of law” — most notably, operations aimed at discrediting the Vietnam War peace movement and the struggle for civil rights. Mr. Church set out to prove such a case and opened uncountable drawers filled with dirty linen. But as testimony brought out, many of CIA’s claimed misdeeds were performed on presidential orders, and Mr. Church had to sidle away from his key charge. Nonetheless, his crusade resulted in the creation of intelligence oversight committees in both houses of Congress. In the opinion of many retired and present officers, the result is that intelligence now is run by hypercautious lawyers, rather than professionals. Officers shy away from risky (but important) operations rather risk grilling by hostile congressmen in public hearings.